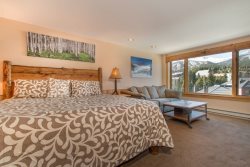 This cozy two bedroom/two bathroom condominium is ski-in by way of Four O’clock Trail and ski-out by way of the Snowflake Chair or by skiing down to the Breck Connect Gondola via Skyway run. Located just three blocks from historic downtown and Main Street, Tyra Summit sits between the mountain and chair lift - perfect for a day of play on the trails. The Breckenridge Outdoor Education Center is also just moments from the property, providing not only great tips for wildlife viewing in the national forest area but also outdoor learning experiences to people of all abilities. Enter the 1,118 square foot condominium and step into the bright great room which features vaulted ceilings, several large windows, a rock wall wood-burning fireplace, rustic décor, a flat screen TV, and a walk-out deck. Enjoy stunning views of Baldy Mountain, the Continental Divide, and Breckenridge Ski Resort’s Peak 10 from the unit’s private deck all while you prepare dinner on the gas grill. Utilize the unit’s updated granite and well-appointed kitchen: The condo comes fully stocked with all of the plate ware, utensils, and cookware that you will need to complete your home-cooked BBQ meal. In each of the two bedrooms you will enjoy beautiful wooden wall paneling. The first bedroom is situated down a hallway, just off from the living and dining area. Perfectly suited for any traveler, the guest room features two twin beds, a flat screen TV, and a private bathroom located just outside of the room. Upstairs, you will have access to the open and spacious master bedroom. The master features a king bed, a flat screen TV, and an en suite bathroom with jetted soaking tub. Attached to the master is the large loft area, which features a queen sleeper sofa. The loft overlooks the living room, but does include wooden shudders for your privacy and convenience. The family room contains another queen sleeper sofa. Ski in directly to the back of the building via the Four O'Clock run! From this stellar location the Snowflake Chair is 200 yards away - just a short walk or ski down the road with easy access to Peaks 8 and 9. Simply hop on the town’s FREE bus that picks up from Snowflake Chair to get down to town or up to the base areas as well. In the Winter, guests can enjoy access to skiing, snowboarding, dog sledding, snowmobiling, cross country skiing, and more! In the summer, guests can hike to Sawmill Reservoir via Sawmill Creek Trail by walking across the road to find the trailhead located just near Snowflake Chair. Or, more adventurous visitors can hike the 4 O’clock Trail to the 12,998 foot summit of Peak 8. Guests are also able to go swimming, biking, fishing, golfing, horseback riding, white water rafting, mountain biking, or just relax on the unit’s deck to enjoy beautiful mountain scenery and crisp air. Parking for one vehicle in the parking lot. Additional paid parking is available overnight at the Satellite Lot (1690 Airport Road, $5/24 hours, on red and yellow shuttle routes). Great place to stay ! Perfect location and great view ! The house was clean and perfect for the four of us. Beautiful, clean and well appointed condo! Four O'Clock run is literally across the street, so it's 30 seconds off the slope to get home, and a short (1 minute) ski down to Snowflake lift to get back on the Mountain. This was a perfect place for our family of four! Great place to stay! Easy access to the mountain and Breckenridge nightlife. Amazing place, with awesome views... Looking forward to coming back.